Oops - we don't appear to have a video for the DocuMate 752. The Xerox DocuMate 752 is a production flatbed scanner with 120-page capacity ADF, scans documents at 50 ppm and 100 ipm through Hi-Speed USB 2.0. The Xerox DocuMate 752 brings low-volume production scanning to any organization at the right price with high quality. Software bundle includes Kofax VRS, and ScanSoft OmniPage. The use of low-volume production scanners for regulatory compliance is sharply on the rise, the Xerox DocuMate 752 makes compliance easy for any scanning operator. With its A3-size flatbed, previously too large documents are not a problem. The ADF allows scanning of documents landscape or portrait. New regulatory compliance requirements have dramatically increased the need for companies to implement secure and reliable records management and document capture solutions. 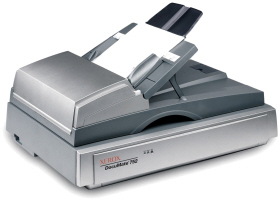 Low-volume production scanners are ideal for document management in small to mid-volume applications and may also be used to complement higher volume products in distributed scanning settings. Document capture solutions have become essential to meet the everyday document imaging needs of businesses in the finance, insurance, healthcare, transportation and education markets. Many healthcare providers today have developed complicated workaround solutions to manage paper records and cope with inadequate or limiting technology. However, the DocuMate 752 can offer a better solution when integrated with today's leading medical records and workflow software applications for the healthcare industry. Likewise, law offices, courts, clients and administrators handle and manage substantial quantities of paper. An attorney's billable hours may be his stock and trade, but signature on paper is the medium of much of our legal system. Documents are the substance of communication, reference, negotiation and execution of contracts, laws and evidence. Fast, reliable and cost-efficient document imaging solutions, like the DocuMate 752, provide almost immediate ROI when implemented in legal offices. The DocuMate 752's powerful software, robust functionally and hardware specifications delivers the speed and quality for production scanning. The DocuMate 752, file format flexibility including text-searchable PDF.